Dreams Of Gold And Power The mountains are brimming with the lure of fortunes--from gold to a booming fur trade. A man at home in this once pristine wilderness, Preacher knows there's no turning back civilization now. What he doesn't know is that beyond the plans of some men is a deadly enemy with far more dangerous designs. . . Schemes Of Blood And Betrayal With vengeance-hungry criminals shadowing his every move, Preacher meets a beautiful woman working to bring a rail line to a remote settlement. And while Preacher is distracted by both the beauty and by beastly outlaws, Indians attack the outpost--and settlers fight furiously back for their survival. One Man's Fight For The Future Of A Land. . . When the smoke clears and blood dries, Preacher realizes that he's in a war more deadly and complex than any he's known. Agents of a foreign government ignited the Indian attack. And they've got far bigger plans--and only Preacher stands in their way. . .
Acquista Preacher's Pursuit in Epub: dopo aver letto l’ebook Preacher's Pursuit di J.A. 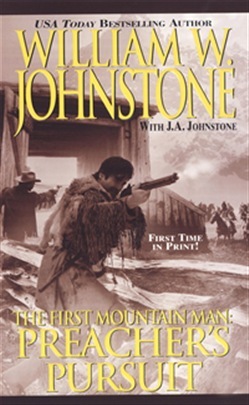 Johnstone, William W. Johnstone ti invitiamo a lasciarci una Recensione qui sotto: sarà utile agli utenti che non abbiano ancora letto questo libro e che vogliano avere delle opinioni altrui. L’opinione su di un libro è molto soggettiva e per questo leggere eventuali recensioni negative non ci dovrà frenare dall’acquisto, anzi dovrà spingerci ad acquistare il libro in fretta per poter dire la nostra ed eventualmente smentire quanto commentato da altri, contribuendo ad arricchire più possibile i commenti e dare sempre più spunti di confronto al pubblico online.